Husqvarna Power Washer – Pressure washers provide the power to quickly remove loose paint, dirt, rust, mildew and other foreign buildups in numerous residential and commercial applications. Pressure washers actually save water, utilizing only about 1/3 the volume of a standard garden hose. 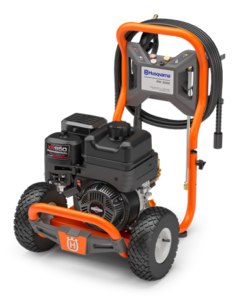 This Husqvarna commercial grade pressure washer is self-contained and is powered by a Briggs & Stratton engine. It provides 3200 PSI of pressure and flow of 3.0 gallons per minute. A variety of pressure tips are available for different applications, and a 50 foot hose and spray wand are included in the rental.